10.17.17 On October 14, 2017, twenty-two players celebrated National Chess Day by participating in the Brewer National Chess Day Tournament held at Machias Savings Bank in Brewer. Brian Hurst won the six-player Open section with a perfect 3.0 points. Kaleb Pendleton went unbeaten and untied in the U1000 section with 4.0 points. Here's the tournament report with USCF crosstables. 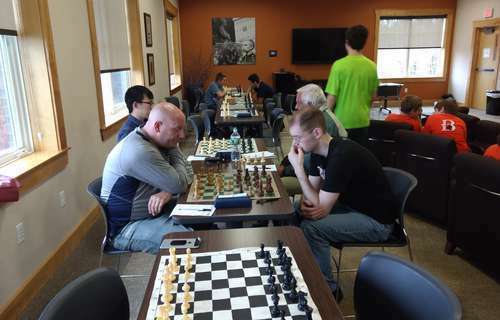 Open section winner Brian Hurst (left) plays Andrew Nevells in round one of the Brewer National Chess Day Tournament on October 14, 2017. Open section winner Brian Hurst turned in a fine performance that put his US Chess rating over 1700 once again. Roger Morin and Roger Hardison both put up 2.0 points and shared equal second. Benjamin Mock and Andrew Nevells each netted a point and tied for fifth/sixth place. Ryunsu Sung rounded out the crosstable scoreless. Kaleb Pendleton showed his supremacy in the U1000 section with a perfect 4.0 points in as many games. 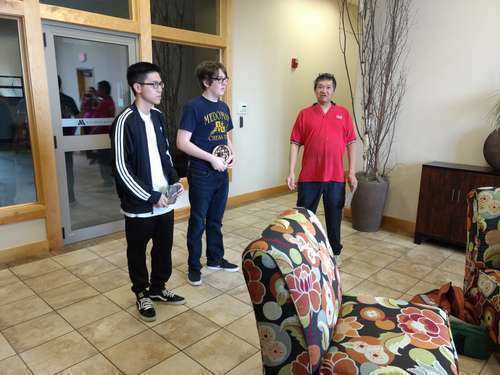 A four-player logjam ensued with Minh Nguyen, Jakob McPhee, Joshua Batstone, and Colby Allen all tied for second. The 2.0-point tier included the following six players: Swaroop Handral, Zachary Arnold, Andrew Bubar, Leonid Wlodkowski, Jordan Fowler, and Damien Sullivan. Kevin Carpenter, Will Grover, Jahfari Maddo, and Amanda Bustard finished equal 12th with 1.0 point apiece. Jackson Dicentes finished in 16th place. Tournament director Steve Wong congratulates U1000 section winners Kaleb Pendleton (center) and Minh Nguyen at the awards ceremony. Thanks to organizer and director Steve Wong, Machias Savings Bank, and all players, coaches and parents for making this a successful event.